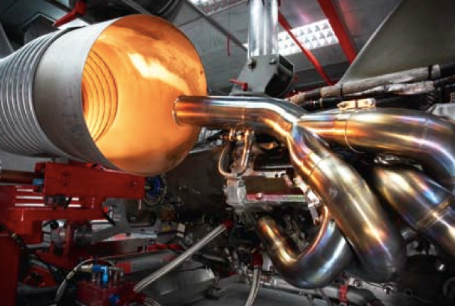 Designing a F1 exhaust system is an extremely complex business that calls for an intimate knowledge of the laws of acoustics if the engineers are to tease the last reserves of power out of the engine. Ferrari F-1 312 Engine exhaust, shot during the Special Ferrari year at the Monterey Historic Races. One of the great V12 engines. That manifold is a magnificent work of art. Can you imagine how long it took to design build and tune that thing! That's because, like in a trumpet, the exhaust gases vibrate at a specific frequency depending on the speed of the engine. 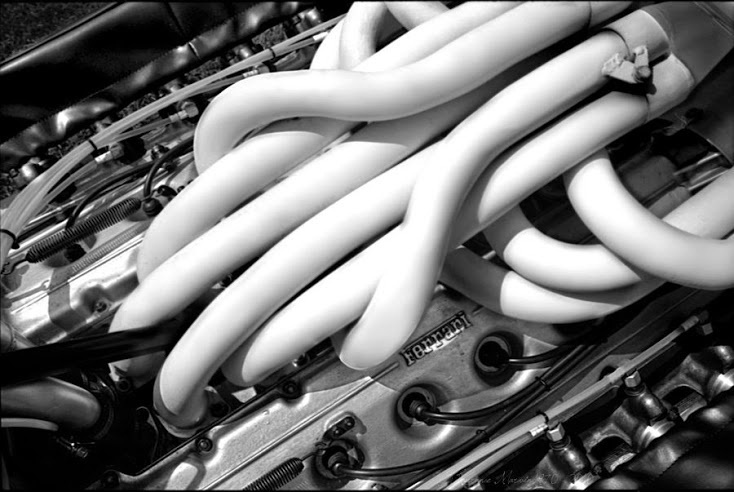 As the valves open and close, they generate a pulsating column of exhaust, with regular peaks and troughs of pressure. To ensure that the 4 cylinders per bank don't interfere with one another in this respect, all the exhaust pipes must be the same length. And at the end of the collector, the exhaust gasses from each bank exit the car from a single tailpipe. Early last century, as piston engines came under the scrutiny of academics, it was noticed that if an engine was run at an RPM such that the firing frequency coincided with the natural frequency of the exhaust system, i.e. the "note" of the exhaust pipe, a resonance was set up in the pipe. However, it was not until MIT published a paper on how this phenomenon could be exploited to increase the performance of an engine, that the tuning of exhaust systems really took off. Among the first to experiment with exhaust tuning were the motorcycle engine tuners. In the late 1940s and early 50s, they tried different length exhaust pipes on their single-cylinder Nortons etc to obtain maximum power and to shape the torque curve. There is some evidence that Mercedes-Benz were experimenting with exhaust systems on their pre-War GP cars, but there is no mention of this in any of the books on these cars and the technique was probably not fully understood. It was not until the 2.5 liter GP cars of the 1950's that we really see exhaust system tuning applied to Formula1 racing engines. The objective of the engine designer is to create a negative pressure at the exhaust valve during the overlap period when both exhaust and intake valves are open. To do this he designs an exhaust system that resonates at a particular RPM, and uses the pressure waves reflected by the ends of the pipes to modify the time history of the pressure at the exhaust valve. By coupling two or more of the cylinders' exhaust primary pipes together, interaction between the pulses created by each cylinder modify the pressure characteristics at any given RPM. The ends of each primary pipe are brought together in a collector, such that their ends are close enough together to interact, and the tail pipe(s) form a secondary resonant system. At the same time, the designer will chose intake lengths to form another resonant system, which also interacts with the exhaust system. When two or more cylinder's exhaust pipes are coupled, the firing order of the engine becomes significant, and the firing order of V-8's are chosen as a compromise between exhaust tuning and the torsional dynamics of the crankshaft. To accomplish an "as much as possible" ideal exhaust, some very different factors have to be compared and calculated. Some of these all very important factors are the exhaust and intake geometry, valve timing, exhaust gas temperature, velocity, and RPM all affect the characteristics. 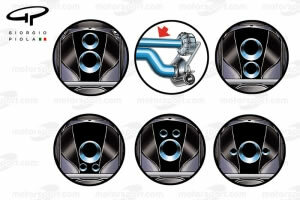 Reminding these characteristics, an exhaust system can only be optimized for one certain RPM. The length of the exhaust pipe affects as well the maximum RPM and suppleness of the engine in lower RPM. 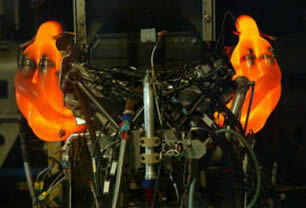 At peak revs, a formula engine will blast out exhaust gases 95,000 times a minute. To scavenge maximum power the exhaust pipes need to be as short as possible. 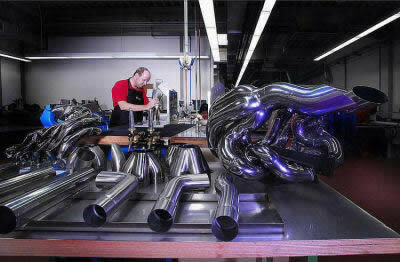 Unfortunately , to help generate maximum torque and responsiveness at lower revs, longer splendor pipes are called for. As F1 regulations don't permit variable-geometry exhausts, the answer lies in the best possible compromise. The exhaust is therefore a compromise between engine power in lower of higher RPM. That brings us to the aerodynamic part of the car. As soon as aerodynamicists knew that a diffuser speeded up the air passing under the car and generated downforce, they discovered that blowing exhaust gasses into the diffuser would affect the downforce significantly. However, another problem raised with diffuser blowing: as soon as the driver lifted the throttle, it would affect the flow of air in, after and immediately before the diffuser and thus also the downforce which was in conflict with the general FIA regulations. Although, as it is proven that any exhaust affects the aerodynamics, forbidding the diffuser blowing in area around diffuser would make all exhausts illegal. This effect on the aerodynamics will probably have been a reason for Ferrari to abandon the regular type of exhausts, and start blowing the exhaust air over the rear top of the car, before the air has passed the rear wing. Raising the exhaust pipes needed heat shielding of the aerodynamic parts of the car. Due to the hot air passing by the rear wing, it would become very fragile if it wasn't protected against such high air temperatures. 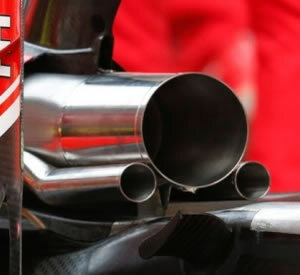 However, further trend have led to Ferrari considering and then adopting an alternative exhaust arrangement. In the quest to move weight forward that has resulted from the width limitation on the rear tires and the grooves in the treads which led to Bridgestone introducing a wider front tire in 1998, the engine has moved forward relative to the rear of the bodywork, defined in the regulations by the rear axle centre line. At the same time the peak RPM of engines climbed relentlessly upward, now 18,000 rpm. Thus, while exhaust pipes needed to become shorter to stay in tune with the higher RPM, the exhaust pipes had to be longer to reach the trailing edge of the underbody. For Ferrari, the arrangement that provides for nearer optimum length exhaust pipes, by leading them the short distance from the engine to an exit port set into the top surface of the bodywork, is better than one that still blows into the base region around the trailing edge of the diffuser. For McLaren and their, in this time, engine partner, Mercedes-Illmor, the latter layout provides them with the best compromise. The two arrangements have other implications, for instance the Ferrari exhausts raise the mass of the tailpipe, centre of gravity and part of the primary pipes above the lower position possible with the McLaren exhausts, and require heat shielding for the bodywork and top suspension links, particularly when they are manufactured in CFRP. The heat from the exhausts also plays upon parts of the rear wing structure that are normally spared, and must be protected or reinforced. Nevertheless, F1 exhausts rarely completes more than 1200km since the need to save weight means they have to be designed close to the limit. The thickness of the heat-resistant steel adopted from the aerospace industry varies but is never more than 1 millimeter. But what eventually kills these waste-gas works of art is not vibration or temperatures of 1000 degrees and more, but stress, The different radii of the various pipes ultimately produce fatigue which leads to cracks where the stress is greatest. Not surprisingly, at this high level of performance even the best exhaust are soon exhausted. Cutting of plate is often done with a waterjet cutters. 2. To re-energize the low pressure air at the back of the diffuser to create more rear downforce. 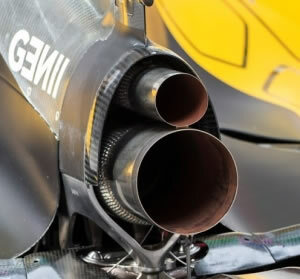 The blowing effect of exhausts gases is not a new thing, and has been a factor in Formula 1 since 1983 when Renault first routed their exhausts into the diffuser aft of the flat bottom on the RE40 (V6 Turbo), idea first conceived by Renault’s Jean-Claude Migeot. Migeot actually routed both exhaust and turbo wastegate flow directly into the diffuser. Back then the diffuser was 1000 millimeters width and not split like the current versions are (due to the step plane regulations). 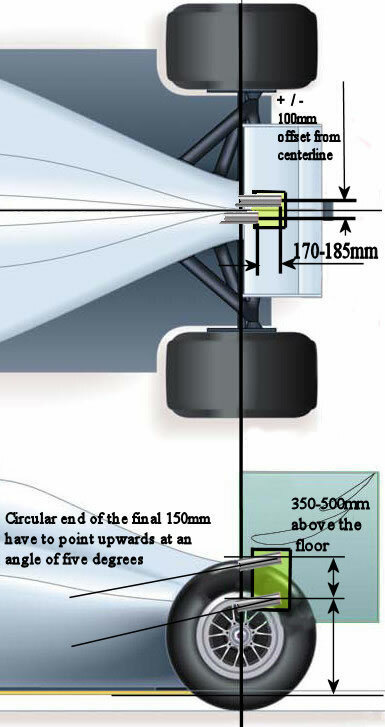 The FIA has acted several times since the mid eighties to cap the potential of the diffuser by reducing its length, height, ride height and position relative to the rear axle. Moving air through the diffuser is the key to it producing downforce, or Mass flow as the aerodynamicists call it. It has again fallen to Red Bulls Adrian Newey to look at the history book and re-invent a concept that has since fallen out of favor. By mounting the exhaust outlets in line with the floor, they blow through and over the diffuser driving greater airflow and hence creating more downforce. In 2011 the top teams focused a lot of resources on extrapolating aerodynamic performance from their car's exhaust gases. By channelling the gases through the diffuser the teams boosted rear downforce and they also developed engine maps that meant the gases continued to flow even when the driver was off the throttle. 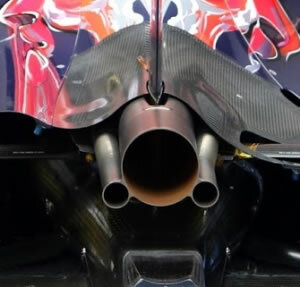 For season 2012 FIA has outlaw blown diffusers and teams are forced to run with periscope exhausts. New positioning of the exhaust pipes exits and limitations are shown on picture below. Exits of the pipe can be positioned inside green box with exhaust tailpipe pointed upwards. But this was not sufficient to eliminate exhaust-blown diffusers. Well, the first thing to note is that it is not possible to point the exhaust exit down at the diffuser in same way as before, this will not necessarily prevent the exhaust jet itself from blowing in that direction. When an exhaust jet exits into a cross-stream of fresh air, the exhaust jet bend with the air stream, effect called "Downwash". After that, coanda effect (Coanda – The tendency of a gas or liquid coming out of a jet to travel close to the wall contour, even if the wall’s direction of curvature is away from the jet’s axis) will take over and "glue", now energized air stream (mixed with exhaust jet) to the bodywork and rute it in direction of the floor and diffuser. At the middle of 2013, an updated version of Formula 1's 2014 technical regulations has been issued. 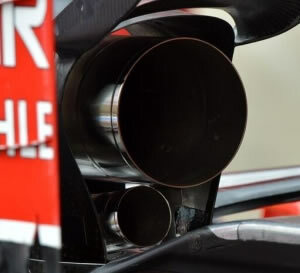 While before explained exhaust positioning rules, introduced at the start of year 2012 are strict, teams still gain a huge amount of downforce from the blowing effect. With both the Coanda and downwash effects, the diffuser is effectively sealed at its sides by the exhaust plume, giving around two seconds per lap in performance. The new regulations for the 1.6-litre turbocharged V6 engine era mandate a single tailpipe of fixed dimensions, which must exit 170-185mm behind the rear axle line and 350-500mm above the floor. With the circular end of the final 150mm of tailpipe having to point upwards at an angle of five degrees, any aero effect from the exhaust will be hugely restricted. Bodywork is also banned in the area behind the tailpipe's axis, preventing vanes or winglets from diverting the plume towards the rear wing or diffuser. 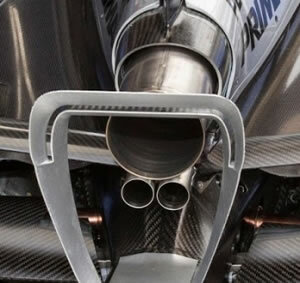 One dispensation is that the exhaust can be offset from the car's centre-line by 100mm, which could allow the retention of the monkey seat winglet. While current exhaust positioning rules, introduced at the start of last year, are strict, teams still gain a huge amount of downforce from the blowing effect. With both the Coanda and downwash effects, the diffuser is effectively sealed at its sides by the exhaust, giving around two seconds per lap in performance. 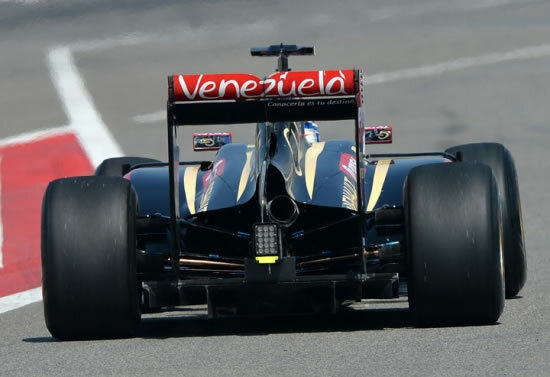 Lotus Renault Formula 1 team during Bahrein preseason test, February 2014, only team in this time with with its single wing pillar offset to the left and the exhaust exit offset to the right of the centreline. After engine rules change for 2014, and since the V6 turbo engines were introduced at the start of the 2014 season, Formula 1 has faced waves of criticism over the noise produced by the hybrid power units. The 2016 regulations have been changed to make the exhaust sound louder for this season. The exhaust has to be split into separate exhaust pipes for the turbine and the wastegate – with teams given the option of having either one or two wastegate exits. "Engine exhaust systems must have only a single turbine tailpipe exit and either one or two wastegate tailpipe exits which must all be rearward facing and through which all exhaust gases must pass. "All and only the turbine exit exhaust gases must pass through the turbine tailpipe and all and only the wastegate exhaust gases must pass through the wastegate tailpipe(s). None of the tailpipes may be contained within any of the other tailpipes." With the exhaust tail pipes now split, the exhaust sounds will be separated and should be more distinct from each other. So the exhaust note should be more interesting, but not necessarily a lot louder, although track tests have yet to be carried out publically to confirm this. However the problem is that F1's new turbo-hybrid engines use every bit of these gasses to spin the turbine and charge the battery through the ERS-H. Therefore the wastegate is only used when the pressure exceeds what is required to operate these components. 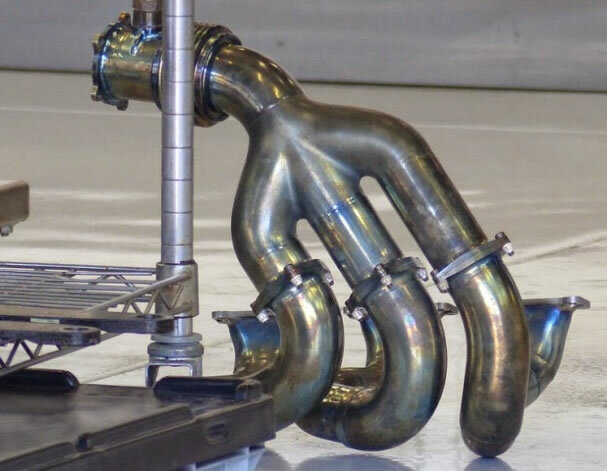 The wastegate tailpipe - the part they hope will make some extra noise to please the fans in the grandstand - will only operate at certain times, not constantly and at unregular times throughout a lap. But problem before was not only that wastegte was always closed. The problem we had previously is that the wastegate was fed into the tailpipe, but most of the time the wastegate was shut, so it was just a dead end connected to the tailpipe. This dead end acted as a silencer. If you look down at a normal street car silencer there is a perforated tube with wadding and a jacket on it, and that dead end was acting like a silencer, the same principal. There are several different ways of approaching the design – and if one team finds a way of cleverly blowing exhaust gases on to some aerodynamic parts it could deliver a performance benefit. 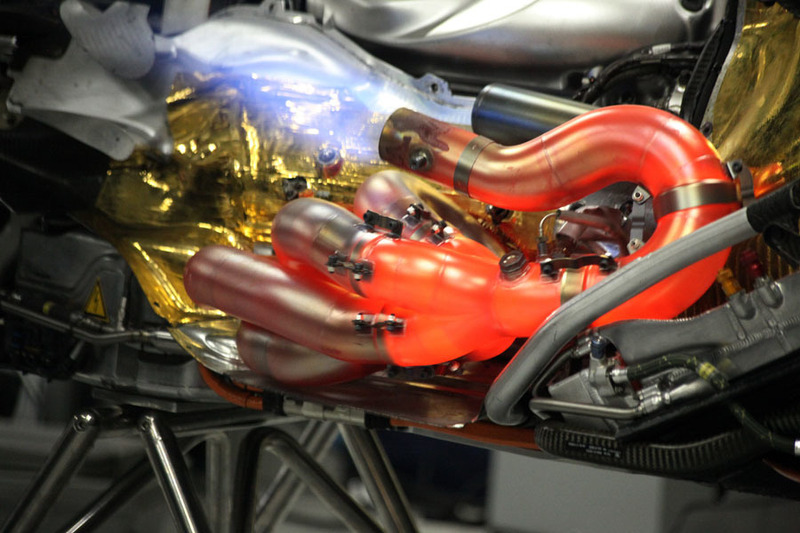 “The wastegate was causing a sort of silencing of the main exhaust pipe,” explained technical chief Paddy Lowe in a Mercedes video. Now, the wastegate will have its own exhaust pipe in order to create more noise and, according to Lowe, “It will work”. His counterpart at Williams, Pat Symonds, agrees, saying recently that the volume could be 25 per cent louder in 2016. 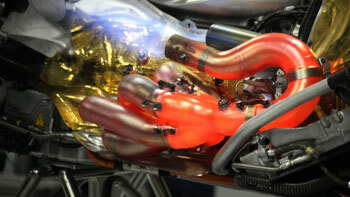 To learn more about new 2014 rule change and new Formula 1 Power Units and ERS System follow this link. 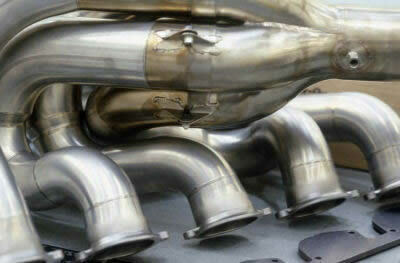 Check my article and learn more about high performance road car exhaust.